The Virginia Institute of Marine Science hosted a two-week Larval Fish Workshop October 5-16 to introduce students, collection managers, and other professionals to the study, identification, and care of specimens representing the earliest life stages of bony fishes. VIMS is home to the Nunnally Ichthyology Collection—the largest fish repositories in the state—which in addition to more than 300,000 adult specimens of freshwater, Chesapeake Bay, and deep-sea fishes, maintains a sizable collection of larval fishes derived from research cruises worldwide, including extensive collections made as time series in the Northwest Atlantic, south-central Atlantic, Central Pacific, and Southern oceans. The workshop was funded by a grant from the National Science Foundation’s Collections in Support of Biological Research program, with an overall goal to safeguard VIMS’ larval fish collection and preserve it for current and future scientific research. Spearheaded by collection curators and professors Eric Hilton and Sarah Huber, and VIMS professor Deborah Steinberg, the workshop also featured five experts in larval fish taxonomy from across the globe: Drs. Jeffrey Leis (Australian Museum), Nalani Schnell (National Museum of Natural History, Paris), G. David Johnson (Smithsonian), Ann Matarese (NOAA, Alaska Fisheries Science Center), and Peter Konstantinidis (VIMS). Workshop participants included three VIMS graduate students, one VIMS laboratory technician, a volunteer, five participants from across the U.S., and two international students from Brazil and Israel. VIMS graduate student Nadya Mamoozadeh says she had practically no background with larval fishes prior to the workshop. “The opportunity to work with some of the world’s leading experts on how to identify larval fishes from unique and diverse sample collections was the main reason I wanted to participate,” she says. 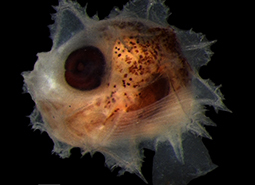 The specimens in the larval fish collection were sampled serendipitously during one-time and recurring zooplankton studies in oceans around the world. These field projects—including long-term time series in the subtropical Atlantic and Southern oceans, and comprehensive studies of how physical features such as mesoscale eddies and the Amazon River plume affect plankton distribution—represent some of the largest investments the National Science Foundation has made in interdisciplinary oceanographic research in the past two decades. “The collections the workshops aim to sort and catalog were made to test specific hypotheses concerning the effect of the physical environment and anthropogenic-induced environmental changes on zooplankton communities—hypotheses that readily lend themselves to studies of larval fish ecology as well,” says Steinberg. The grant will lend support for a workshop next year as well. 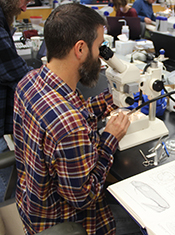 The workshops—both two weeks in duration—include lectures on larval fish identification led by guest larval fish taxonomists, which are followed by identification of selected samples from VIMS collections. During the workshop, participants sorted through and identified the plankton samples to the family level. The lecturers delivered information on larval fish taxonomy, anatomy, sample preparation, digitization, and other topics of interest, such as preparation of cleared and stained specimens, and imaging techniques. Participation was limited to 12 individuals to ensure maximum impact and interaction with the invited experts. Participants were selected based on an evaluation of a cover letter describing what they hope to gain from their involvement in the workshop.